When it comes to keeping kids safe, there is no substitute for adult supervision. But no parent can be everywhere, every minute! BABY-LOC removable fencing is a convenient, cost effective additional layer of protection to help deter toddlers from gaining access to a swimming pool. Baby-Loc is also the perfect choice for a raised deck or dock. Standard removable pool fencing is built to a 4-foot height. Yet it’s clear that most toddlers can easily scale a fence this high! BABY-LOC meets all ASTM standards and exceeds U.S. consumer product guidelines with a height of 4 ½ feet, to better protect your children. As an option, BABY-LOC offers the most reliable self-closing, self-latching gate available. 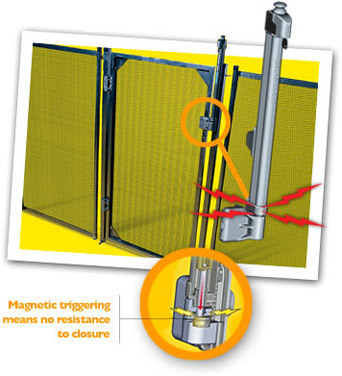 The unique latch uses a powerful magnet, which requires very little force to secure. It’s also key lockable. Injection molded hinges can be easily adjusted with a screwdriver for just the right amount of force – so the gate closes and latches itself, every time! You can turn any section of your BABY-LOC fence into a gate opening – simply have your installer provide a fall-back hole wherever you’d like. Fence sections open in a snap for easy parent access. Superior poly-coated, open-weave mesh black fabric offers high tensile strength and excellent UV stability. Won’t rip, stretch or fade. Resists mildew, fungi and bacteria. And cleaning is a breeze! Choice of premium fiberglass or aluminum poles. Both types are non-corrosive, rust-proof, and color-matched to our black fabric. HIGH-QUALITY CONSTRUCTION with superior poly-coated open-weave mesh fabric and choice of premium fiberglass or aluminum poles. Solid brass double-ended latchs with stainless steel spring loaded trigger mechanism will never rust or corrode. SO EASY TO PUT UP AND TAKE DOWN, you’ll want to use it whenever you want an extra measure of protection for your young one. Choice of premium fiberglass or aluminum poles. Both types are non-corrosive, rust-proof and color matched to our black fabric. So durable it comes with a 5-year pro-rated warranty.